Fill your child’s Easter basket with some cute little toys! Fill their Easter basket with some great hair accessories and hair care products! How about giving your child some beauty and fashion accessories? Most tween girls would love these items! Easter is about the resurrection of Christ. Here are some gift ideas to nourish and build your child’s faith. Encourage your child’s creativity with these lovely gift ideas for the budding artist! After Easter, we can often expect the weather to warm… which means more time outside to play! Here are some great gifts for the outdoors! If your children look forward to treats in their Easter baskets, maybe consider some of these healthier choices! 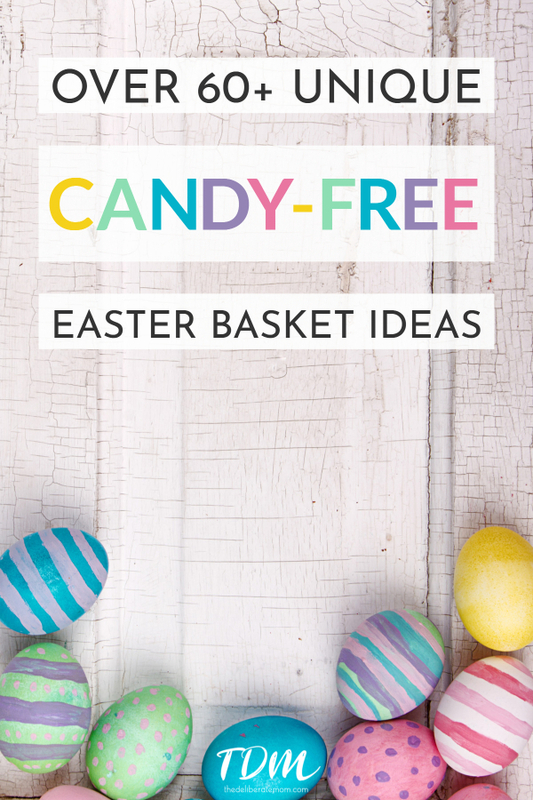 Here are some additional ideas for candy-free items you can put in your child’s Easter basket! It may seem like a challenge to find candy-free Easter basket ideas… especially when most stores showcase chocolates and jellybeans! However, as you can see with a little research and creativity, there are plenty of candy-free items to include in your child’s Easter basket! Thanks for sharing Janine! I’ll have to check out your Easter list! Seems like today was easter basket ideas as I did one similar as well. These are all great ideas as we’re moving away from candy this year ourselves as well. LOL – I guess everyone’s thinking Easter baskets, hey?! I’ll have to check out your list too! These are so adorable. Who wouldn’t want silly putty and mini baby dolls? I know I do! We do some candy, but it’s good quality See’s candy. (although they think it’s made by the Easter Bunny) And then some nice little things like the above. As you know, my kids are mostly Jewish and a little Catholic and a little Mormon and I get so confused by sharing the meaning of Easter with them, so I appreciate that you have those details above. I’d like them to learn about faith. I’m delighted you found these Easter basket suggestions helpful! Wishing you a lovely week my friend! Thanks for taking the time to research and suggest some great books and music ideas. They aren’t the usual Easter stories or songs, but good new resources to look for to add to our collection. Might need a bigger basket to collect the fun items. Thanks Melanie! I’m glad these resources were of help and inspiration to you!